Welcome! 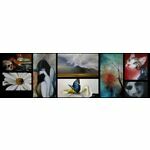 I offer 100% original paintings in a variety of subjects and styles: still life, realism, modern abstract, art deco, contemporary, impressionism, traditional landscape, animals, and portraits. Please add me to your favorite sellers list and check back often!